Keeping track of your cryptocurrency across multiple exchanges can be a chore. 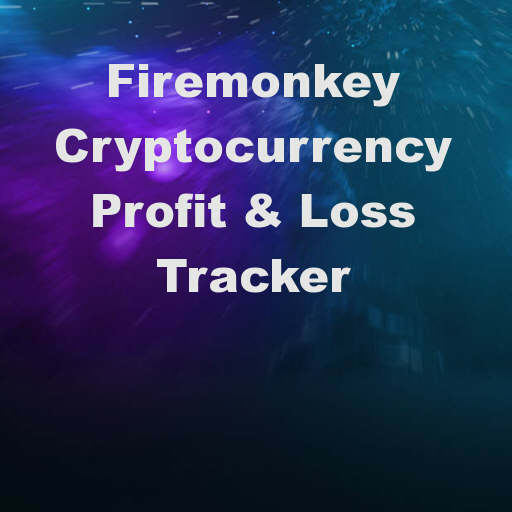 I built this simple cryptocurrency profit and loss tracker for your bitcoin and altcoin holdings. Basically the tracker ties into the CoinMarketCap.com REST API for getting currency quotes and allows you to store your current holdings in an FDMemTable. Once you add all of the cryptocurrencies that you hold into the TStringGrid you can add the price that you paid for them and the amount that you have. The app does the needed calculations automatically using the quote data that it pulls down from CoinMarketCap when you press the Refresh button in the app. I built the app interface mainly for Windows but it should also work well on OSX plus Android and IOS tablet devices. It does use a TMultiView to hold the list of 1300+ cryptocurrencies (double click to add) but some of the controls could be re-arranged for a better layout on phone size devices (by using a TTabControl). There are two TFDMemTables within the app. The first one is tied to the TRESTClient controls which I created using the REST Debugger. The REST Debugger basically has a cheat button which will create all of the needed controls to access a REST API and pull the data into a TFDMemTable with no code. 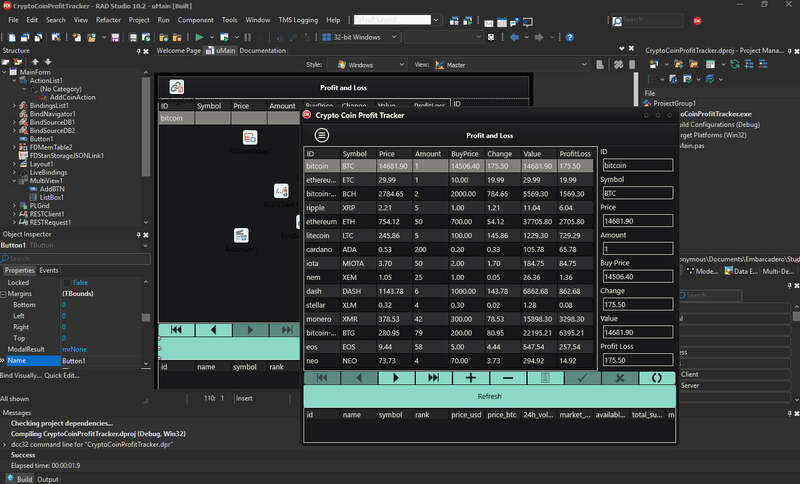 In any event the TFDMemTable tied to the REST client holds the quote data that you request from the CoinMarketCap API. The other TFDMemTable holds the list of your cryptocurrency holdings. Both TFDMemTables are LiveBinded to their own TStringGrids. When you select one of your cryptocurrency holding records in the second TFDMemTable you can also edit the data in the edit fields on the right side of the app. They also use LiveBindings for updating the data in the holdings TFDMemTable. I also used the Vapor premium style to get the look and feel of the app. I have published the full source code for the app over on GitHub. According to the Delphi IDE stats it took around 21 minutes to build this app. Be sure to check out the other blog post about integrating Delphi with the GDAX cryptocurrency trading API as well. 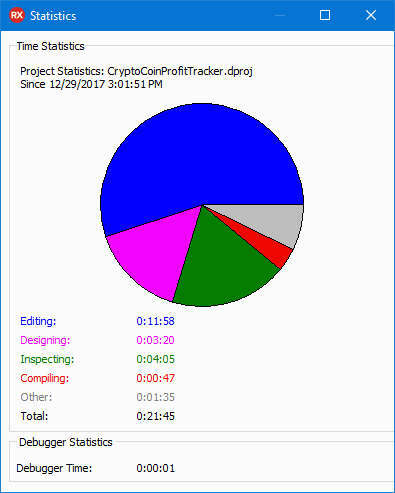 Head over and download the full source code for the Crypto Coin Profit Tracker for Delphi on GitHub.